The first week of my 50 Book Challenge and I finished the book! Is that too many exclamation points to kick off a post? I don’t care because I’m off to a good start with this challenge and I’m feeling pretty excited! Seriously, every time I have a dry spell in finding a good book, I need to remember that I can always turn to Sarah Dunant. With reading Sacred Hearts I’ve finished all of her historical fiction, so I’ll have to try her earlier work, which is in the thriller genre, unless the follow up to Blood & Beauty comes out (fingers-crossed). For now, I just enjoyed devouring Sacred Hearts. 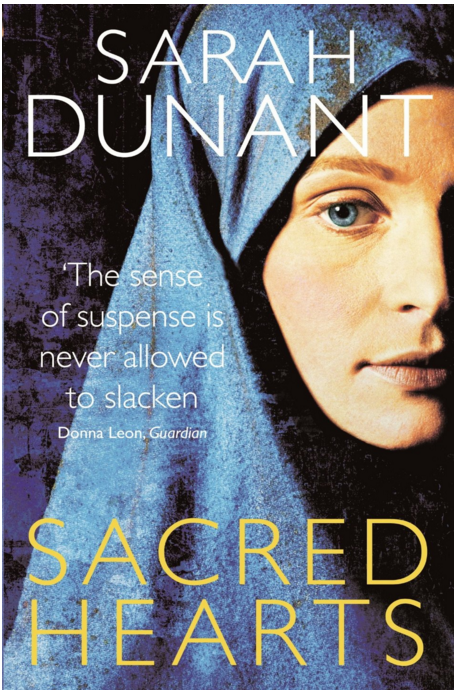 Published in 2009, Sacred Hearts was shortlisted for the Walter Scott prize for historical fiction. The story takes place in the convent of Santa Caterina in 1570 in the city of Ferrara. Serafina, a novice, is entered into the convent against her will and is placed in the care of Suora Zuana, the dispensary mistress. While Caterina and Zuana bond as they work side by side in the dispensary, the head of the convent, Madonna Chiara, manoeuvres to fix the novice’s place in the convent while maintaining peace within its walls. Through all this, Serafina is used as a conduit through which convent struggles to find a balance between the warring forces of the counter-reformation and a more well-rounded experience within the strictures of convent life. At two moments in the book, I really wasn’t sure how the story would unfold and could see the plot spinning off in totally different directions. This is one of Dunant’s great skills – presenting the possible outcomes before pushing the chips in one decisive direction. The first break takes place as Serafina carries out a plan of escape from the convent and is confronted by Zuana. The second is as Suora Umiliana, the sister in charge of the novices, makes moves to unseat Madonna Chiara and change the lives of all who dwell in the convent. The way Dunant is able to unfold both these plot lines feels unforced and true to the world she has created. All at once, you believe the contradictory thoughts that everything is both an inevitable progression as well as the consequence of random decisions and moments. Dunant’s other great strength is her ability to weave historical detail into the story in a way that doesn’t just provide context but also enhances the characters’ personalities and moves the plot forward. The opening chapter sets the stage and players so clearly, you feel completely immersed in their world very quickly, mostly due to her eye for detail for the lives of the women whose story she is telling. On another day, I’ll do a close read of the opening scene and try to highlight the layers of history and character that Dunant uses to set the scene and lead in the reader. Having finished this book makes me regret that I only put in one book from each author (excluding David Adams Richards) for my 50 Book Challenge. I count Dunant in my top five favourite authors and I’m really glad that I started this challenge off with such a strong book. I hope it bodes well for the rest of my choices.